The human sense of hearing has the ability to perceive combinations of tones as being in tune or out of tune. 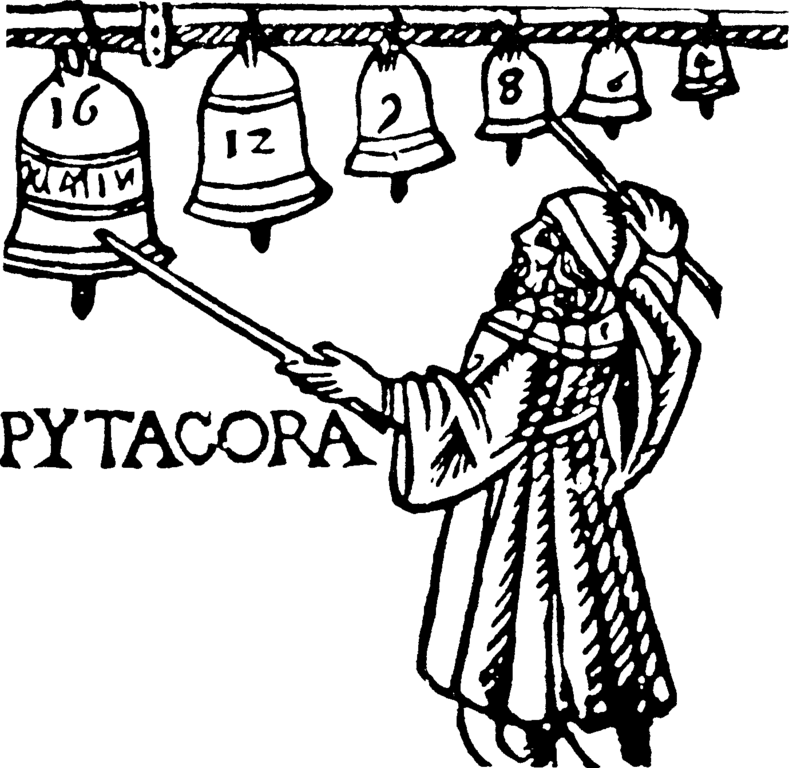 The Greek mathematician Pythagoras was among the first to note that well-tuned intervals correspond to simple rational frequency ratios. For example, the perfect fifth corresponds to a frequency ratio of 3:2. The occurrence of simple ratios is due to a fact that musical sounds do not only consist of their ground frequency but also involve a complex series of higher partials (overtones) at integer multiples of the ground frequency. A musical interval is perceived as harmonic or in tune if the frequencies of the overtones partially coincide, leading naturally to simple frequency ratios. Is this not the case, the almost-overlapping partials generate dissonant beats, acoustically perceived as an increase and decrease in volume. The ratio for a just fifth is (3:2), for a just octave is (2:1). When you layer 12 fifths, your final note should equal the note that you reach by layering 7 octaves. Unfortunately, this is not the case: (3/2) 12 is not the same as (2/1)7, instead the calculated note differs by a quarter semitone. In other words: the circle of fifths does not close. In fact, one can show that is mathematically impossible to tune a keyboard instrument consistently in such a way that all intervals are just in their intonation. As a solution for this problem, one could divide the octave (2:1) in 12 exactly equally-sized semitones. This defines the equal temperament (ET), the dominating temperament in Western music. However, except for the octave, all intervals in the ET are characterized by irrational frequency ratios, meaning that they are more or less out of tune. Historically this mathematical imperfectness has led to an amazing variety of tuning schemes, called temperaments, ranging from just intonation to the equal temperament (ET). Just intonation aims at maximal harmony, tuning all intervals with rational frequency ratios, but it can be used only in a single musical key. The ET, which is characterized by a constant irrational semitone ratio 21/12, works in all keys but all intervals except for the octave are out of tune. In between there is a large variety of historical unequal temperaments, seeking for a compromise between harmony and scale invariance to a different extent. The ET, today’s dominating Western temperament, is the least harmonic one, but over the last two centuries humanity got used to these discrepancies. Still, many musicians keep on expressing their discomfort with the harmonic shortcomings of the ET. By tuning your piano in just intonation – for example just in reference to the keynote C – you face a certain problem: You are not able to modulate between the keys, much less than playing in another key than C. Static just intonation does not function for different keys. For hundreds of years there have been many efforts to establish a just intonation for a keyboard instrument. To accomplish this goal, keyboard instruments with additional accidental keys have been invented. The number of keys per octave (normally 12) got extended till the number of 72 keys per octave for the Orthotonophonium of Arthur von Oettingen (1914). These kinds of instruments were virtually impracticable. Our software solves this problem by dynamical tuning: Whenever there is a new pattern of keys pressed on the keyboard, the optimal tune is computed instantaneously, trying to get as close as possible to just frequency ratios. As a result you can play in just intonation independent of the key, even if you modulate to different keys. Only for chords which cannot be tuned consistently in just intonation, as, for example, the diminished seventh, a tempered compromise is computed. In the past there have been previous attempts to implement dynamical tuning schemes for electronic keyboards, e.g. Mutabor and Hermode Tuning. Here we use a different method that exploits the power of modern computers which are now able to solve complex systems of equations within fractions of a millisecond. In addition, our project is non-proprietary and free of charge, allowing everyone to experience dynamically tuned just intonation and to contribute to the development of the software. Instead of artificial sounds the application is able to tune samples of real instruments.